The Avg. Group Discount is 18.0%! Susquehanna Bank Center, Adventure Aquarium, USS Battleship New Jersey, Garden State Marketplace and Townplace, Cherry Hill Mall, Loews Cineplex, many restaurants & shopping within 5 minutes. Walking, jogging, biking, mini golf, children's playground and picnic areas located directly behind hotel. "Great stay for a wedding!" We booked a jr. Suite for the bride and the room was big enough to hold the rehearsal. We had a large group, but were always able to meet and relax in the beautiful and spacious lobby. The hotel kept the bar open late for us after the reception. Brunch was amazing the next day! 04-Sep-2018 Verified Review, stayed from Sat Sep 01 to Mon Sep 03 2018 at a $119.00 group rate. The Hilton Philadelphia-Cherry Hill enjoys a beautiful setting overlooking the Philadelphia skyline and the Cooper River/Cooper River Park. A 10-minute drive from historic downtown Philadelphia and PA Convention Center.Hotel amenities include complimentary wireless interenet, free parking, coffeemaker with complimentary coffee, iron & board, hairdryer,cable TV, dual line phones with data ports, outdoor olympic-size swimming pool, fitness center and jogging paths. Our concierge floor features a private lounge with continental breakfast and evening cocktails.Cooper's Bar & Bistro located in the main lobby offers American cuisine and a friendly atmosphere at breakfast, lunch and dinner.Rascals Comedy Club located on property features today's top names in comedy. 20 minutes from Philadelphia International Airport. Full American Breakfast Buffet available for an additional fee and includes continental station, scrambled eggs, chef's specialty entrée, potatoes, and breakfast meat. The Crowne Plaza Hotels highlights above are subject to change without notice. 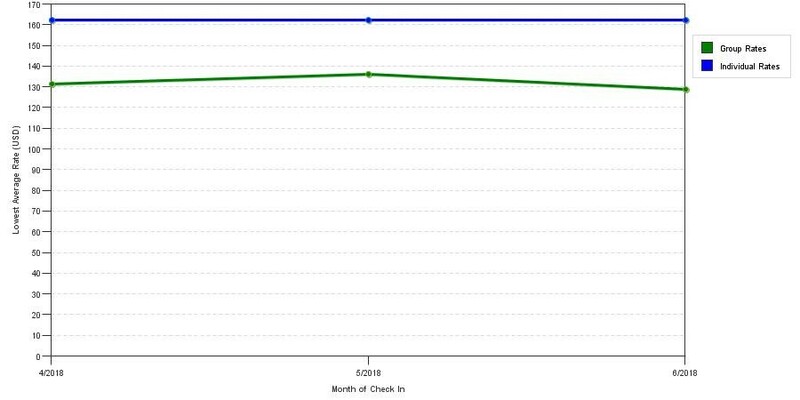 The chart above shows trends of prices for both group prices and the best individual traveler prices our rate checker could find at the time the group/meeting offer was submitted. The lowest group discount displayed is 28.2% in the month of July 2019 and the highest average individual rate is $162 in the month of June 2018. This chart will show past seasonality and also project future months. If you are flexible with dates, you may want to consider staying at Crowne Plaza Philadelphia Cherry Hill in a month when rates are lower. 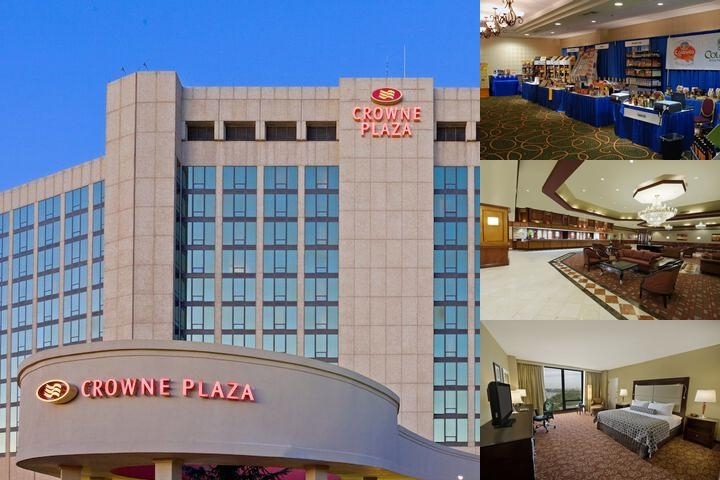 Below are the meeting, banquet, conference and event spaces at Crowne Plaza Philadelphia Cherry Hill. Feel free to use the Crowne Plaza Philadelphia Cherry Hill meeting space capacities chart below to help in your event planning. Hotel Planner specializes in Cherry Hill event planning for sleeping rooms and meeting space for corporate events, weddings, parties, conventions, negotiated rates and trade shows. 100 x 80 x 22 Ft.
171 x 70 x 14 Ft.
132 x 23 x 13 Ft.
54 x 70 x 14 Ft.
41 x 22 x 10 Ft.
75 x 41 x 10 Ft.
111 x 33 x 13 Ft.
29 x 20 x 10 Ft.
59 x 70 x 14 Ft.
86 x 45 x 0 Ft.
72 x 58 x 10 Ft.
41 x 31 x 10 Ft.
32 x 29 x 10 Ft.
46 x 40 x 10 Ft.
23 x 29 x 10 Ft.
28 x 20 x 10 Ft.
46 x 19 x 10 Ft.
58 x 70 x 14 Ft.
37 x 20 x 10 Ft.
27 x 27 x 10 Ft.
37 x 17 x 10 Ft.